This caravan for hire is situated on Butlins Skegness. This is an absolutely stunning caravan and has definitely got the WOW factor. The caravan has neutral colours throughout and a modern contemporary style. The caravan has a central living area and kitchen. This is ideal for anyone wishing to add a little more luxury to there holiday. Bedroom One - With En-suite, Toilet, Large Luxury shower cubicle and Wash Basin. Very spacious. Bedroom Two - Two large singles which can be made into a double by moving the console in the middle of the beds. Play station with lots of gaming discs provided. Bedroom Three - Two large singles. All 3 bedrooms have wall mounted TV's / DVD's. Wardrobes and mirrors. Also have either a double or single duvet and two pillows, All beds are made on arrival with clean linen. Power sockets with USB and mirror. 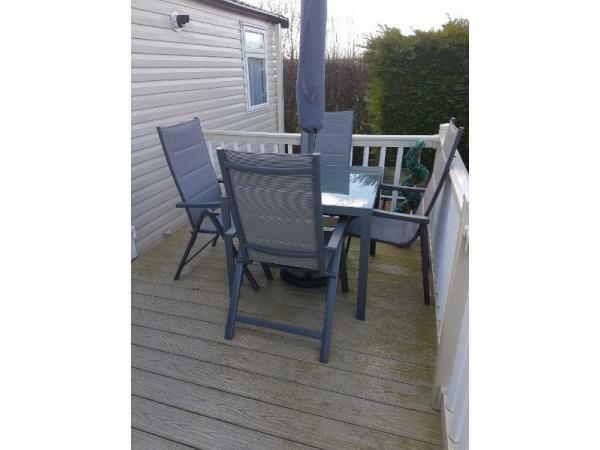 Outside is a UPVc Veranda 12ft x 8ft and patio furniture for you to use, the sun sets on the decking so you have sun all afternoon and there are well maintained conifers giving extra privacy. ****Everything for the kitchen is provided pots, pans etc. ****Bed linen for all beds either double or singles. (If you require the pull out bed please make me aware at the time of booking). ****Enclosed veranda, suitable and safe for children or pets. ****Tea, coffee, milk and sugar will be provided for your arrival. ****Bathrooms equipped with shampoo, body wash, soap and toilet rolls. ****We can provide a towel bale for you to use at an extra cost of £15.00 which includes 4 large beach towels, 2 large bath towels, 2 hand towel and 2 tea towels. If your looking for a fantastic break in a lovely modern new caravan then this is the caravan for you. Enjoy Butlins Skegness and I'll speak to you again I guarantee you will be back for more it's addictive. ANYONE BOOKING AN ADULT BREAK WILL NEED TO TAKE WITH THEM PHOTO ID TO COLLECT THEIR WRISTBANDS (PHOTO DRIVING LICENCE OR PASSPORT) THESE WILL NEED TO BE SEEN ON CHECK IN. We also have another caravan on Butlins,Paddock060- userid 1953, Paddock 064 and 065 if you need more than one. Also, we have caravans and lodges on Tattershall Lakes, Sleaford some with Hot Tubs - userid 4312 / 5104 / 5513 / 5299 / 5418 / 5515 / 5543 / 5619. To ensure you don't miss out on future breaks you can secure your next holiday with us for this year or next year for just £100 deposit. Thank you Mandy. Thank you very much Eunice for your kind words. Its a pleasure welcoming you and your family to our caravans. Hope to speak soon. This is by far the best caravan I've stayed in. The service is outstanding and would highly recommend. Booked for 2017. Customer service is 5 star. Like home from home. Thank you very much. It's a pleasure.